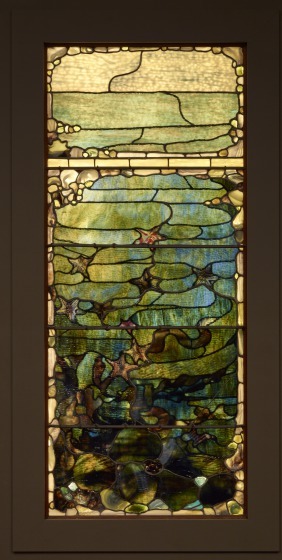 The languidly aqueous appearance of this window by Louis Comfort Tiffany's firm suggests the transformation of molten glass providing an appropriately watery effect for images of undersea life. Borders of thick stone-like glass "jewels" and multiple layers of wavy, twisted and rippled "drapery" colored glass provide a setting for starfish, anemones, and other sea life to float suspended in the lower portions of the window. The upper segment reveals the placid surface of the ocean with sky above. 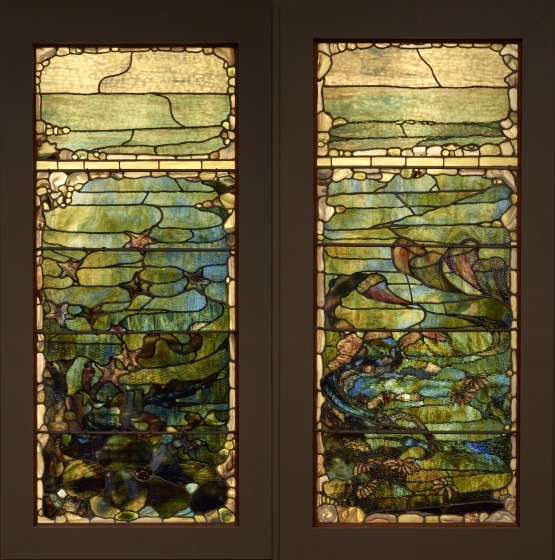 Although themes of water and marine life would be revisited in some of his later Favrile vessels, enamels, and lamps, Tiffany produced very few windows with such aquatic scenes, and even fewer exhibiting such sophisticated abstraction as seen in this example and another similar one also in the DMA's collection (2008.21.1.McD). The pair, part of a suite that may have depicted the four seasons, demonstrate Tiffany's appreciation of Japanese art and his innovative approach to stained glass design. Both windows show Tiffany at the height of his creative powers, experimenting with the texture and translucency of glass to create a masterful aquatic fantasy of color and form. Kevin Tucker, DMA unpublished material, Label text, 2008. Bonnie Pitman, ed., Dallas Museum of Art: A Guide to the Collection, (Dallas: Dallas Museum of Art; New Haven and London: Yale University Press, 2012), 209. Learn about Louis Comfort Tiffany (1848â0131933). Listen to sound designs created by UT Dallas students in response to these windows. National Geographic ~ Learn more about the starfish depicted in this window.